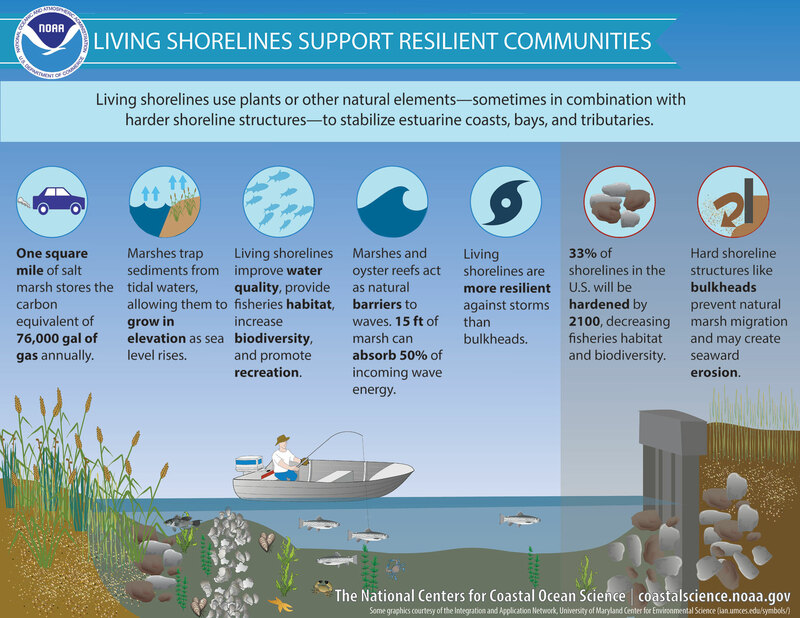 NOAA encourages the use of living shorelines as a stabilization technique along sheltered coasts because they are effective barriers against erosion and provide habitat for coastal species. Coastal communities in Florida face constant challenges from shoreline erosion. Although erosion is a natural coastal process, many valuable resources border our state’s coastline. Shorelines need protection from damage caused by intense storms, wave erosion, and sea-level rise. However, shoreline stabilization does not need to create a barrier between land and water, as happens with hard shoreline stabilization structures like seawalls and bulkheads. New stabilization options, like living shorelines, are gaining attention as an alternative to traditional shoreline stabilization techniques. Living shorelines can reduce damage and erosion while simultaneously providing ecosystem services to society, including food production, nutrient and sediment removal, and water quality improvement. Living Shorelines take a ‘greener’ approach to stabilizing the shore, as seen in the options toward the left of this diagram from the Natural and Structural Measures for Shoreline Stabilization brochure created by the Systems Approach to Geomorphic Engineering (SAGE 2015). Diagram from NOAA Living Shorelines. While preservation of natural, living shorelines is a key to environmental health, restoration is sometimes needed to recover shorelines that have been degraded or destroyed. Shorelines are often stabilized with hardened structures, such as concrete seawalls. However, these structures can increase the rate of coastal erosion, remove the ability of the shoreline to carry out natural processes, and provide little habitat for estuarine species. On the contrary, living shorelines are an environmentally friendly, cost-effective method to restore, protect, and stabilize shorelines, waterfront property, and coastal wetlands. Provide for shorelines that are resilient to storm damage and sea level rise. A gradually sloping interface between land and sea helps maintain a plant community that can adapt as sea level rises. In addition to shoreline protection, living shorelines have economic, ecological, and aesthetic value. Installation of a living shoreline is more cost effective than maintaining or rebuilding seawalls. Living shorelines create, connect, and enhance diversification of animal habitats, and improve water quality by filtering pollutants – like a living “kidney.” These natural shorelines are becoming a pleasant and preferred alternative to man-made structures. It is important to note that living shorelines should not be placed on already functioning shorelines. However, as shoreline development continues, a living shoreline approach is preferable to hardened seawalls. Shoreline hardening such as seawalls can alter natural shoreline processes, reduce nursery habitat for marine species and foraging habitat for wading birds, degrades water quality, and can actually increase erosion processes. Turn the gradually sloping profile into a right-angle bathtub effect with limited habitat potential. Can increase erosion on adjacent property beyond both ends of seawall. Are often the shoreline protection option selected to “hold-the-line”. Create an abrupt transition from deep water to dry land that eliminates the inter-tidal zone where many marine and estuarine species live. Do not provide any filtration of runoff as it transitions from the land into the estuary. Site Analysis- As in any restoration project, the anticipated land where the living shoreline will be placed must first be evaluated for factors such as the shore elevation and erosion rate, wave energy, prevailing wind and wave direction, vegetation, and soil type. The design of the project is based on this initial analysis. Site preparation- Once all necessary permits are obtained, the site is then cleaned of all debris, unstable trees and any failing seawalls that might exist. Issues with runoff should also be addressed prior to material installation. Installation- Once your site is prepped, it is time to start installing your living shoreline materials. In Florida, a living shoreline is typically comprised of one of three components: oysters, mangroves and salt marsh grasses. Information on each of these is provided in more detail in the sections below. Post construction monitoring and maintenance- In order to verify that a living shorelines is doing its job, it must be monitored to gather information on the success of the project for the purpose of improving the construction and implementation of future efforts. Maintenance activities include debris removal, replanting vegetation, adding additional sand fill, and ensuring that the organic and structural materials remain in place and continue to stabilize the shoreline. Eastern oysters (Crassostrea virginica) form extensive intertidal and subtidal reefs in coastal estuaries along the Atlantic coast and Gulf of Mexico. Oyster reefs are currently threatened by coastal urban development, changes in salinity, and destruction by dredging. They are beneficial in providing protection from coastal erosion, water filtration, and habitat for aquatic species. There are many techniques for restoring oyster reefs, which may be adapted to suit different restoration sites. Large-scale techniques include the deposit of unconsolidated cultch, which is the mass of stones, broken shells, and grit of which an oyster bed is formed, in the subtidal zone or the deployment of concrete structures (e.g. reef balls, stackable forms) parallel to the shore. Small-scale techniques may include building reef structures with wire mesh containers filled with shell, small stackable concrete blocks, oyster bags filled with cultch, or oyster mats. Oyster reefs should be monitored long-term to evaluate the progress and effectiveness of restoration efforts. Using mangrove forests for mosquito control impoundment which involves placing an earthen dike around the area and purposely flooding it during the mosquito breeding season. It is important to identify the cause of mangrove decline prior to restoration. Removing stressors (e.g. eliminating invasive species or modifying hydrology) may enable natural establishment and recovery of mangrove habitat. When natural recovery is not occurring, it is necessary to harvest propagules or seedlings and transplant at restoration sites. Projects should be monitored for seedling survivability, growth, and leaf canopy to evaluate restoration success. In Florida, salt marshes are most abundant on coastlines above the winter freeze line, especially along the “Big Bend” area of the Gulf coast. Salt marshes protect the coastline from storm damage, control erosion of soil, purify water, sequester carbon, and provide important nursery habitat for commercial and recreational fish species. Salt marshes are being degraded and destroyed due to altered hydrology, urban development, pollutants, and exotic invasive species. Restoration sites should be carefully selected and examined for modified hydrology (dredging or sediment/slope modification), invasive species, and pollutants. Only native plants should be used in restoration and enhancement projects. Plants can be propagated from seed and grown in a marsh grass nursery. Planting considerations include tides, seasons, density, spacing, and substrate. Monitoring of the restoration area should be conducted at roughly the same date each year during the peak of the growing season and at low tide. Florida Living Shorelines has produced an interactive map to learn about existing living shorelines and appropriate plant species in your area, and to find local contacts to assist with design and permitting. In conclusion, living shorelines have proven to be a more sustainable alternatives to restoration practices such as using seawalls to prevent erosion. Please explore the additional resources below to learn more about this natural approach to coastal restoration. This Florida Master Naturalist Program course was developed by Florida Sea Grant and the Guy Harvey Ocean Foundation to help raise awareness of the importance of natural, living shorelines and alternatives to seawalls for shoreline protection and restoration. Whether you are a concerned citizen, owner/manager of shoreline property, or a volunteer helping on a permitted restoration project, the course will improve your understanding of the benefits and techniques for restoring a living shoreline. The FMNP encourages you to engage in your local community’s shoreline protection and restoration efforts. The first step is to learn about living shorelines and talking to your local restoration practitioners. The next step is to contact your regional Florida Department of Environmental Protection (FDEP), as projects usually require special permits and authorization. To find a course near you, check out our registration website or contact an instructor in your area. Don’t see a course near you, or interested in becoming an instructor for this course? Contact the FMNP Program Coordinator or email info@masternaturalist.org.